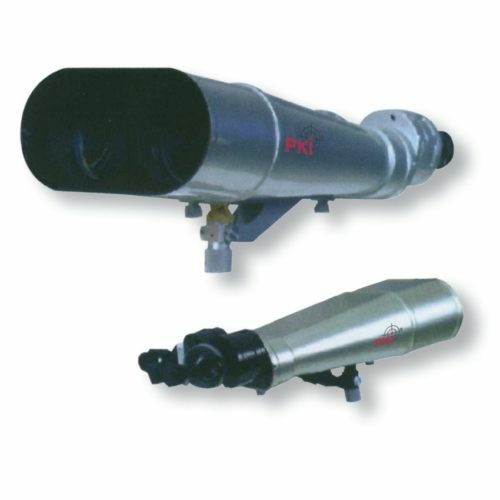 This legendary PKI 5260 model with its large objective diameter of 150 mm, is an magnificent tool in many sectors, covering a large range of applications, such as surveillance operations of suspect objects or persons, border control, fire prevention and other scientific researches, where a crisp, bright, sharp and high-resolution image is indispensable. Many other applications like wild animal observation, sightseeing from the top of high buildings or home balcony, hunting, shipping, fishery, forest observation etc. are also possible. This binocular, with its large aperture and high magnification of 31x to 50x allows a long range, fatigue-proof operation under every condition. The unit is equipped with a fast dual focusing which is ultra smooth. The telescope tube is covered with a protective rubberised paint finish to help protecting it from the elements.